LANEIGE, a global beauty brand that is Oh-So-Popular now and then is having a FIRST ever beauty tour in beauty brand history, and I'm so happy that Malaysia is one of LANEIGE's Beauty Road tour destination and we also get to meet the uprising Korean model Hwang Se On in person! Super excited that I get to meet the recently appointed Laneige model ambassador in such a near distance and also learn more beauty tips from her and LANEIGE. LANEIGE Beauty Road Tour includes seven major cities in four Asian countries starting with Bangkok, Thailand (17th - 19th July), Singapore (24th - 26th July), Kuala Lumpur *yay (27th - 2nd August), then major cities in China including Beijing, Xian, Chengdu and Shanghai from 4th of September till 27th September. One of the star product of Laneige Beauty Road Tour is the BB Cushion of Laneige that everyone is talking about! BB Cushion, huge hype in Korea that every Korean lady have one BB Cushion inside their bag. It is a MUST makeup item to now, a makeup trend in Korea. 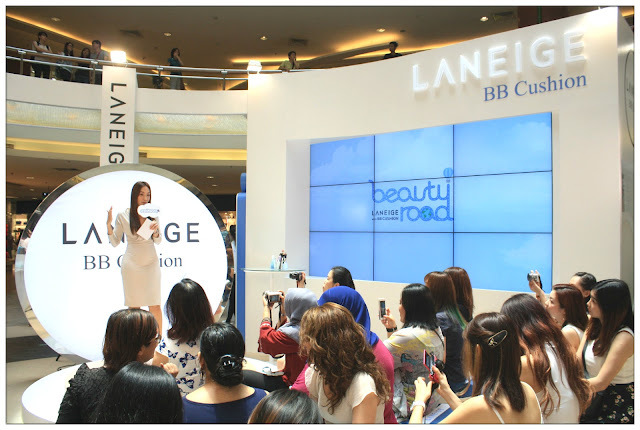 "LANEIGE Beauty Road Tour is such a good opportunity for the people of Malaysia to discover the multifunctional-use of BB Cushion which can be use in many ways from everyday makeup to professional makeup." said Winnie. "Laneige hope to bring the popularity of BB Cushion to the next level by turning it into a global makeup trend starting with Asia and eventually to the other parts of the world." Pore Control: Pore purifying complex that purifies pores and protects skin against pore trouble. Pore Coverage: Excellent coverage of pore and skin bumps with soft focus powder which diffuses light. Semi-matte finish: Powerful dual powder formula of anti-darkening and sebum control powder regulates shine for a fresh and supple looking complexion. Water Resistant: Which means sweat resistant too. Strong resistance against perspiration and sebum for long-lasting makeup. Soothing Effect: Fresh cooling sensation instantly cools the skin surface to refresh and sooth fatigued skin. UV Protection: SPF50+ PA+++ offers strong protection against harmful UV rays and sun damage. Now everyone can have flawless foundation makeup using just LANEIGE BB Cushion with its pore care solutions. No wonder all Korean actresses and celebrities look so perfect on screen and also in real life. Hwang Se On's special appearance at Malaysia station's LANEIGE Beauty Road event proved that achieving flawless makeup using LANEIGE's BB Cushion is effortless! She have cute smile too! 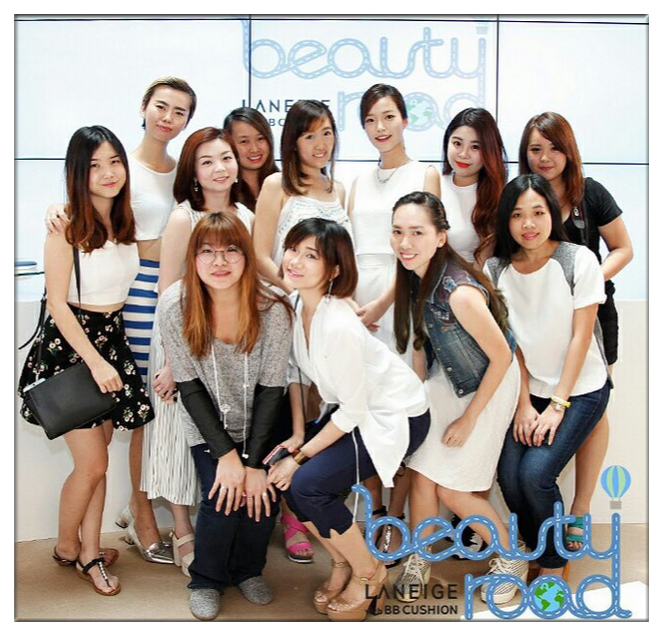 Our Malaysia beauty Belinda Chee looking great that day too! 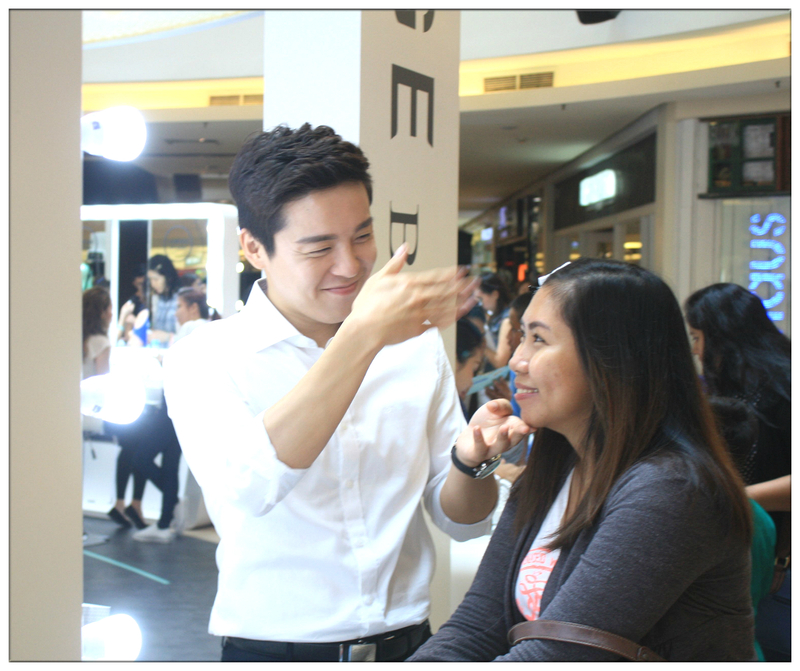 Beside the special appearance of Hwang Se On, there are three Korean makeup artist who are stationed at Malaysia's LANEIGE Beauty Road Tour and Cat Koh, LANEIGE Global Trainer and Makeup Artist personally teach us the K-Beauty makeup style step by step that day. In Korean style makeup, it is all about looking pretty effortlessly. There are tiny details here and there to natural Korean style makeup. Using LANEIGE BB Cushion as foundation, its tight silicon Elastometer is slim enough to gently fill up areas in between the pores, and also soft focus powder works to diffuse reflection, makes you look like you have smooth, flawless skin. Korean style makeup's main focuses are foundation, eyebrow and lip colour, once you get a hold of these three main points, you're definitely gonna look pretty like a Korean ulzzang! Cat the makeup artist is so cute isn't? LANEIGE Beauty Road Tour was held at Mid Valley Megamall's North Court and it was filled with exciting activities with loads of goodies giveaway! 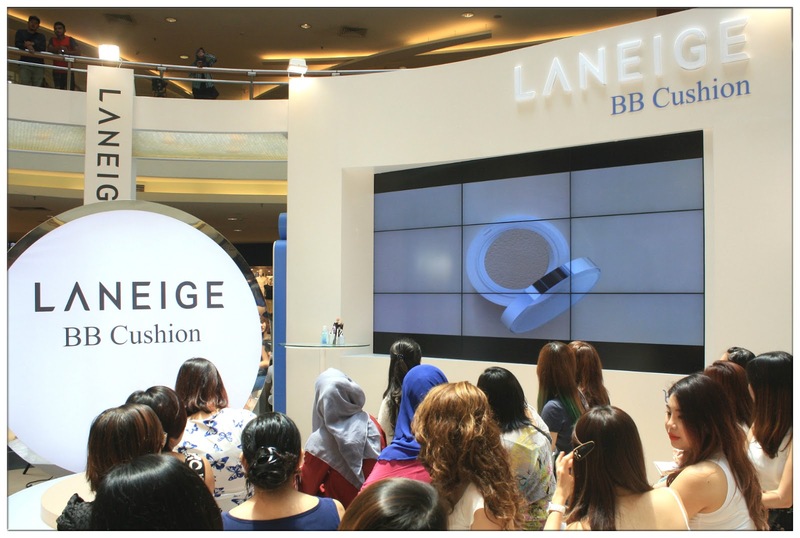 There are BB Cushion testing stations for you to find out which shade suits you best and also complimentary makeover sessions with the help of LANEIGE makeup artists from Korea. Look at the blushing smile of customer, can feel she's gonna drool soon LOL. As a member of Butterfly Malaysia, I'm grateful that I was invited to such exclusive media event during this historical LANEIGE Beauty Road Tour Malaysia station and get to meet Hwang Se On, Cat Koh as well as many talented and friendly faces during the roadshow. So lucky to be featured on LANEIGE Malaysia's Instagram page alongside with all the girls from Butterfly Malaysia and Korean top model Hwang Se On. I've been using LANEIGE BB Cushion Pore Control in Natural Beige (#21) for few days and I really love the texture, the effect and how long lasting my skin stays fresh and matte without extra shine even after long hours of application. Definitely gonna write a detail review of it soon. Stay tuned!